A 32-year-old father who is trying to get back on his feet after a prison stint passed up on a long-awaited job interview in order to save the life of a stranger wounded in a car crash. But now his good deeds are coming back in double, with job offers and donations coming in on his behalf. 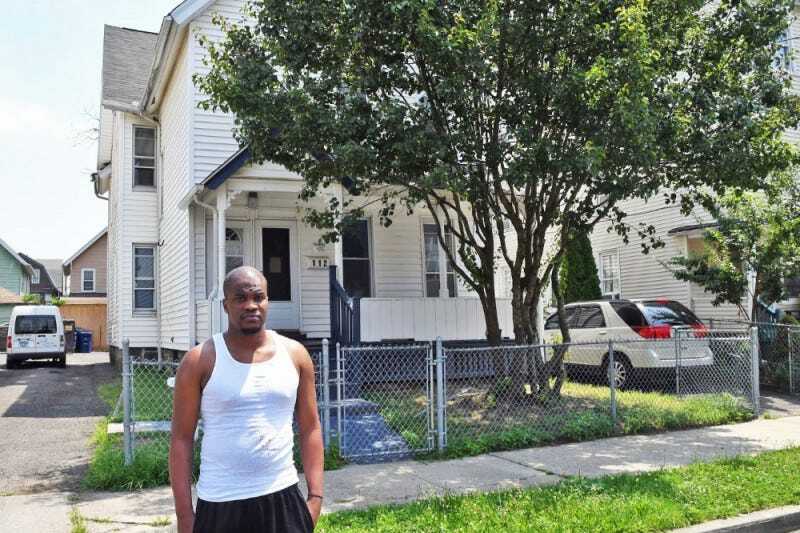 According to the New York Daily News, Aaron Tucker left the halfway house where he currently resides in Bridgeport, Conn., on Wednesday morning with less than $2 in his pocket, en route to his job interview for a busboy position at Dinosaur Bar-B-Que in Stamford, Conn.
“I got up around 5 o’clock in the morning because I was so excited for the interview,” Tucker told the Daily News. However, his day took a much different turn after he hopped on the bus sometime after 9 a.m. Tucker says that when he woke up from a short nap, he saw an overturned vehicle on the road ahead of the bus in Westport, Conn.
“I looked up and saw a car flipped over right in front of the bus, so I ran to try to jump out of the bus,” Tucker said. However, the bus driver was unfazed by the smoking car and by Tucker’s insistence to help. “I said I was going to help him, and asked the driver if he was going to wait for me and he said, ‘No, I am going to leave you,’” Tucker said. Nonetheless, the good Samaritan did not pause to consider his options. “I saw a lot of smoke coming from the car, and I just jumped off the bus and ran to the car,” he said. Tucker went to the vehicle from the passenger’s side so he could unbuckle the driver’s seat belt and remove him from the overturned car. Then, noticing that the driver was bleeding from the head, Tucker took the shirt off his own back—one he had been given to wear to his interview—and used it as a tourniquet to stop the blood loss. Two other men from a nearby auto-body shop also rushed to help the victim. “He kept shutting his eyes and I made sure he stayed awake. I told him to open his eyes. I said, ‘Your family wants you,’” Tucker said. An ambulance arrived and the victim was taken to a hospital, where his condition was reported to be stable. The residents of Westport are hailing Tucker as a hero, but Tucker is brushing off the label, saying he was just in the right place at the right time. Nor does he think it was any big deal to pass on his job interview. Tucker ended up missing his interview, of course, but his kindhearted, and perhaps lifesaving, actions have gotten him three job offers so far, in construction and at a rubber factory. The Westport community also has rallied around him, starting a GoFundMe, which has raised more than $11,000 in 18 hours. Still, Tucker remains humble and brushes off the praise. “I just want everybody to know it’s not about what people could do for me. It’s just about me saving his life,” he said. Tucker is trying to piece his life back together after serving a 22-month sentence on a weapons-related charge. One of his top goals is to get a job so he can support his 21-month-old son, who currently lives with his mother.